It can be difficult to spot a scam and fraudsters can be very cunning, but we have identified seven common signs of a scam. 1 Contacted out of the blue? 2 Is the deal too good to be true? 3 Asked to share personal details? 4 Pressurised to respond quickly? 5 Are the contact details vague? 6 Spelling or grammatical mistakes? 7 Are you asked to keep it quiet? It can be difficult to spot a scam. Fraudsters are extremely cunning and good at creating convincing scams. You may avoid falling for scams by asking yourself these seven simple questions. If you answer yes to any of the following, there's a good chance it's a scam. Fraudsters might seek to take advantage of uncertainty and confusion around Brexit to trick us into parting with our money. Watch out for these Brexit scams which fraudsters may use before, during and after the UK's departure from the EU. An unsolicited call can be a sign of being contacted by a company you don't want to deal with. However, companies do sometimes call their customers out of the blue for a legitimate reason. If you're called by a company, make sure you do all you can to verify the identity of the caller. Ask them to give you details that only the company will know. For instance. your service contract details, payment details or bank account details. If you're not 100% convinced of the identity of the caller, hang up and contact the company directly from a different phone. There are some instances, though, where it's best if you're the person to instigate the first contact. For instance, if you're looking to make an investment or if you're looking for a new bank account or credit card, you should always be the first one to make contact. Scams will often promise high returns for very little financial commitment. They may even say that a deal is too good to miss. Use your common sense, if a deal is too good to be true, it inevitably is. Never share your personal details with anyone you can't validate is who they say they are. Phone scammers will often try and get valuable personal data from you, and they can use this to steal your identity or steal your money. You should be especially weary if someone asks you to do a bank transfer as this offers the least amount of protection. Salesmen in particular should always give you time and space to make an informed decision, anyone who tries to rush you is not to be trusted. Vague contact details can be a PO box, premium rate number (starting ‘09’) or mobile number. If anything goes wrong it's important you can contact those involved. This will be difficult if you don't have accurate contact information. Premium rate numbers are also a favoured trick for squeezing every penny they can out of you. Legitimate organisations will rarely, if ever, make glaring spelling or grammatical mistakes, and if so they will usually be an isolated incident. Being asked to keep something quiet should be a red flag. It's important you can discuss any agreements with your friends, family or independent advisors. Often asking you to stay silent is used to keep you away from the advice and support you need in making a decision. 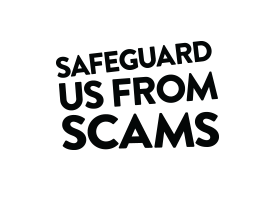 If you've come across a scam, take a look at our guide to reporting it to the right organisation.